Sandpoint Idaho is a gem of the Northern Rockies. 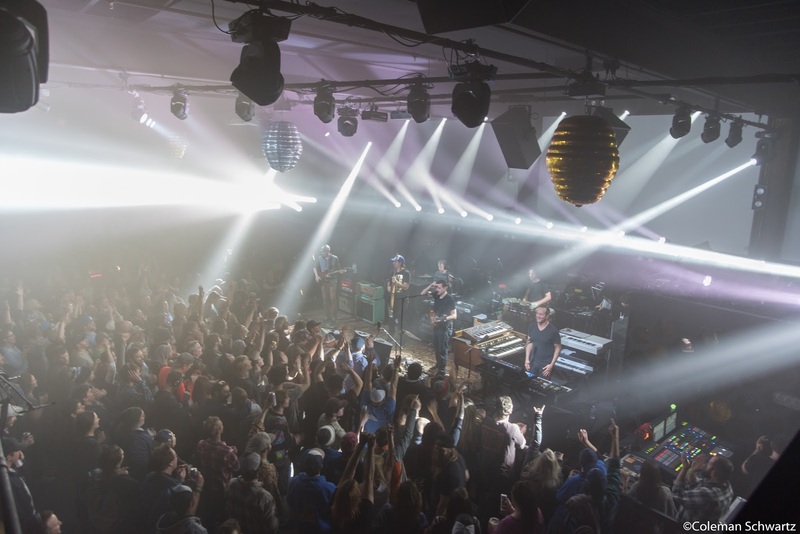 With Schweitzer Mountain a mere thirty minutes away, this small ski town has the charm of its old timey fur trapping roots, and yet contains a venue that presents some of the best live music in the region. The Hive is an up and coming club in the region. Two years after opening its doors in 2013, it’s gotten off the ground by bringing in some big shows. The bumble bee décor is done with wit and imagination. The bathrooms are done in a hexagon hive pattern tiled in yellow, brown and black. In the main stage area three bee hive shaped disco balls hang over the crowd. An intimate venue capping out at about five hundred persons, it buzzes with energy for the band as well as the lucky attendees. Surprisingly it was not packed with Umphreaks. I grabbed a place about three rows back center only fifteen minutes before show time. Needless to say this four night trek through the inland Pacific Northwest would be special to say the least. One thing I noticed was how stripped down their light rig was just to fit into this venue, adding certain distinction to this run. Things started off the “Evening With” building very “improggy” with the title track off of their most recent album Similar Skin. It’s a very King Crimson-esque track with lots of progression through key and time signatures. Jake Cinninger threw out some uber industrial metal riffs with excellent syncopation, with the two guitarists layering riffs in different time signature on top of each other. They then moved into a nice jazzy anchor drops era jam accompanied by “whooos” from the crowd. Slowly the musical excursion turned to a funky hip-hop realm that put out vibes reminiscent of J Dilla. One phrase that came to mind during this movement was “ambient drip,” interpret that as you will. The band dug deep in this one with a heavy back beat from Kris Meyers and Andy Farag augmented with patient guitar work from Jake and Brendan, along with some stand out synth brocades from Joel’s end. Next we moved into the catchy original from late 2000 recorded on disc two of The Bottom Half, “Alex’s House” which saw Jake Cinnenger whip out the slide for some great noodling. 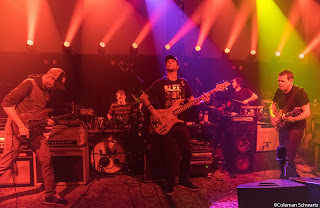 Following that nice romp they unleashed "Der Bluten Kat" (aka DBK) a twenty plus minute composed original and old school Umphrey’s classic that oddly has yet to get the definitive studio performance it deserves. This song, which contains multiple sections/stanzas was wrapped around a new track that nearly came across as a Brendan and Joel duet until it expanded and brought in the whole band. This originated out of a “Jimmy Stewart” and showcased the unique song writing process this band loves to utilize. They are literally writing new songs live on stage through a series of hand signals. Watching a new song develop live on stage is one thing that drew me to these guys in the first place back in 2005. They returned back to "DBK" to close out the set. In the second half, Jake displayed some notably low register finger tapping on his guitar, sounding gritty yet sharp at the same time. He flirted increasingly with some jazz phrasings until plunging into an avant-garde free jazz section. Set one fixed a high bar for what was sure to be an epic four night romp through the inland Pacific Northwest. The band sprang out of the gates in the second set where we were treated to the always epic "Miss Tinkles Overture." Taken out of a mid-1990’s super Nintendo Mega Man soundtrack, it’s always a treat when Jake steps down and lets Bayliss take a solo. Though Jake is clearly the “shredder”/”face melter” of the band, Brendan’s guitar chops should not be disregarded. Early in this rendition we were reminded of that via some finger tapping on his guitar. Things turned a bit EDM-y as they moved into a jam reminiscent of STS9 and EOTO. It’s clear that Chicago influenced their sound over the years considering Chi-town is the birth place of modern “house music.” This “four on the floor” jam got the crowd good and sweaty just in time for Jake to switch guitars and perform some guitar hero riffs illuminating his affinity for Sammy Hagar and 80’s metal in general. Next was the classic fan favorite, "Syncopated Strangers." The first half was fairly standard. 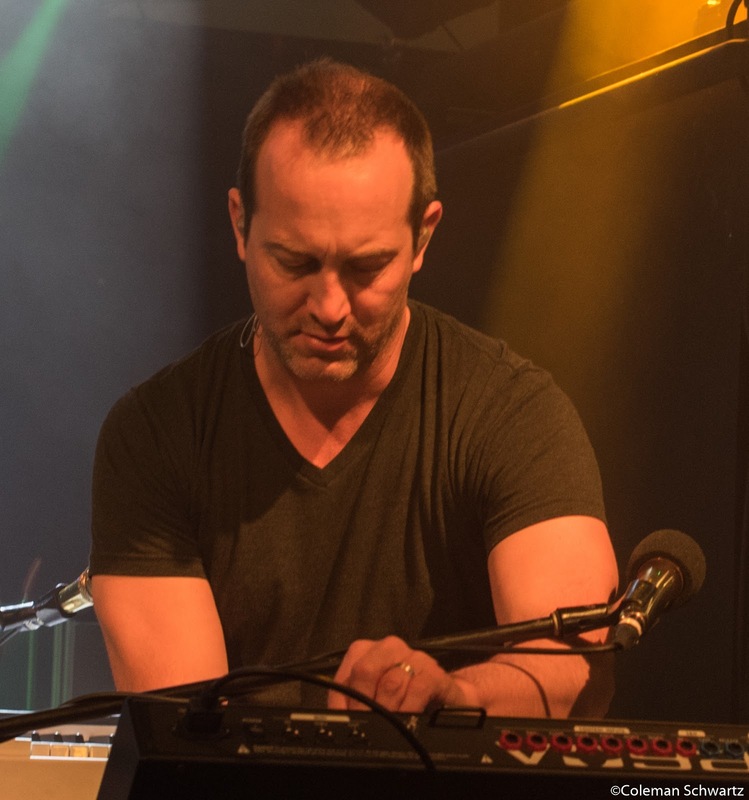 Just as the band was approaching the “churchy” second half of the song, Joel began experimenting on his Moog synthesizer. Then Jake picked up on the spaceyness, and began doing what I can only describe as “space-scatting.” There was some sort of effect on his voice, similar to the demon voice in "Resolution." Needless to say this little improvisational flourish grabbed attention. Then they dropped into the beginning of the Zeppelin Middle Eastern tinged classic, "Kashmir." They jammed on those classic lines for a bit then turned into a Rage Against the Machine jam, specifically "Killing in the Name." This was a musical tease as they went back into the latter half of "Syncopated." This has always held a soft spot in my heart. Its gospel/churchy vibe cuts deep and features some patient and soulful playing from Jake. Next, the first actual cover of the night with "Girlfriend is Better" (Stop Making Sense) by the Talking Heads. The heat was spiked from the first bar. Again, feeling their Chi town roots in house music they delved into a nice trance jam coming out of the beloved 80’s funk classic. Coming out of that sultry groove we returned to an earlier period in Umphrey’s career with (one of my personal favorites) "The Fussy Dutchman." 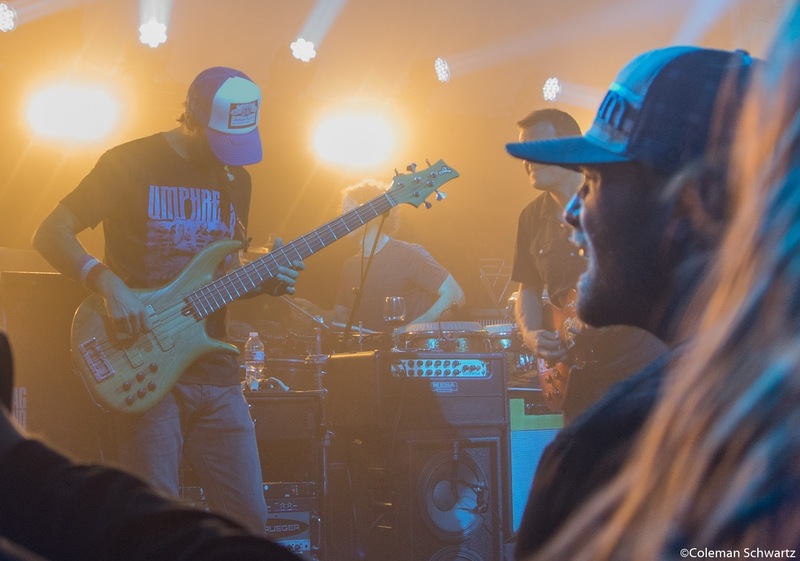 The cascading guitar work accompanied with Stasik’s chugging bass groove sent smiles all around The Hive. Also notable, some incredibly passionate playing from Brendan Bayliss. Once again, Jake deferred to Bayliss’ lead. 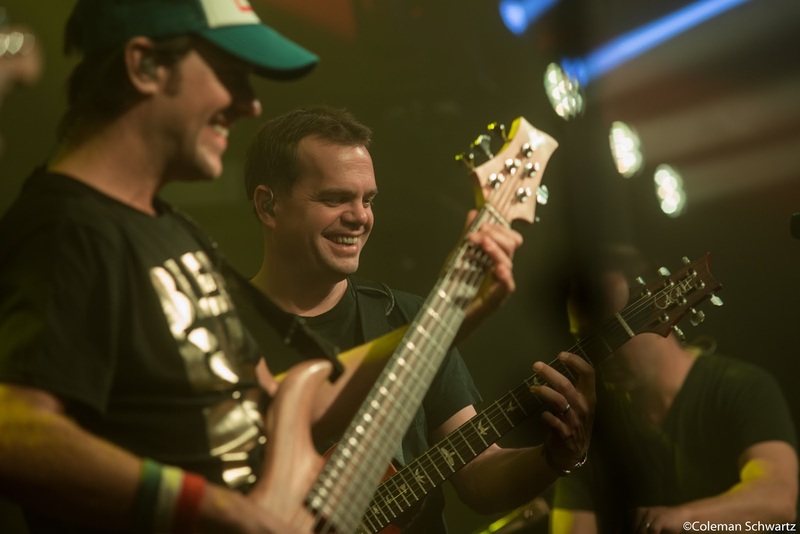 When it happens it sends shivers down my spine, which is why I feel Brendan’s playing more than Jake’s face melting, almost mathematical approach to guitar playing. It’s like comparing pro vert skateboarders Christian Hasoi to Tony Hawk. One is about style and emotion; the other about athletics and pushing the envelope beyond the laws of physics. After “Fussy Dutchman” the band took a minute to swig their respective beverages. Bayliss seems to be on a wine kick, whereas Stasik was sticking to the Non-Alcoholic St Paulie Girl. A dozen years back I remember they proudly and exclusively downed Budweiser. Hey, that was fifteen years ago and people get married and have kids and I am glad to see that family/drugs have not slowed this band down in the least bit. Towards the end, Jake threw out some rowdy bluegrass tinged riffs, possibly as a nod to the musical climate of the inland PNW. But they turned out to be a feint as they pivoted into a 2008 original, "The Floor." Honestly, I have never been the biggest fan of this track, but I smiled and enjoyed it nonetheless. The encore was special. The set list called for “Conduit,” but in a last minute audible call the band decided on “Hangover,” hands down my absolute favorite Umph tune. I edged to the front to fully enjoy this personal favorite I had not heard live since Columbus, Ohio in 2011. The song features slow, slinky, funky guitar work along with some great chanting i.e. “ALL NIGHT LONG” after every measure. Tonight they did not break out the booty wax chant for it was not Saturday night. On that note, let’s hope they bring it out for Saturday in Missoula. The funky syncopated jazzy break down, reminiscent of Shakedown Street, never fails to get me dancing. As this scorcher wound down to the end right around 12:30 AM the band bid the crowd good night, wishing people fun on the slopes tomorrow, sending people out into the streets of Sandpoint grinning ear to ear. That was that for night one. Day two in Sandpoint got off to a delicious start, waking up in our crew’s beautiful Lake Side rental cabin and cooking a feast of breakfast. Some went up to Schweitzer Mountain get some turns in, and possibly see Joel and Jake on the slopes. Others decided to relax at the epic crib and later explore downtown Sandpoint. With a population of about seven thousand, this is a small town for such a big band. I heard through the grapevine that the owner of The Hive is a friend of the band. Maybe this explains the attraction. Or perhaps it’s the jaw dropping beauty of the backdrop. As I walked into The Hive that evening, I was surprised at the light crowd. That would change later. 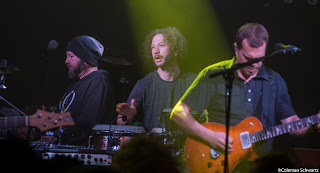 Milling around and talking to some fellow Umphreaks, I heard that the band opted out of a set list for this evening’s performance. Instead they would pick from a grab bag of about twenty-five tunes in no particular order. Anything could happen in this remote Idaho panhandle town. First up, some old business. The band opened with an expansive “Conduit,” the song they were planning on encoring the previous night. The original Um song began appearing in rotation circa 2011, Death By Stereo era. This track sums up their signature “improg” sound very well. Full of progressions through time signatures and keys, the song progressed into a nice uplifting “Jimmy Stewart.” Up next was the newer track, “Loose Ends,” which gave off a pop-grunge vibe and featured ample use of the “Jake Blade,” a custom whammy device. “Hurt Bird Bath” hit The Hive like an imperial asteroid from some far off galaxy, then spread its smoke and fire out across more than 20 minutes of the first set. Things got pretty dancey during the middle stew section. The room was filling up now and the energy was reaching a boiling point. The jam moved through some interesting regions entering a Pink Floyd-tinged section and into jamtronica synth work from Joel’s Moog. From there, we landed back into "HBB" and a roar from the crowd. “Wife Soup” featured a passionate solo from Brendan towards the end. 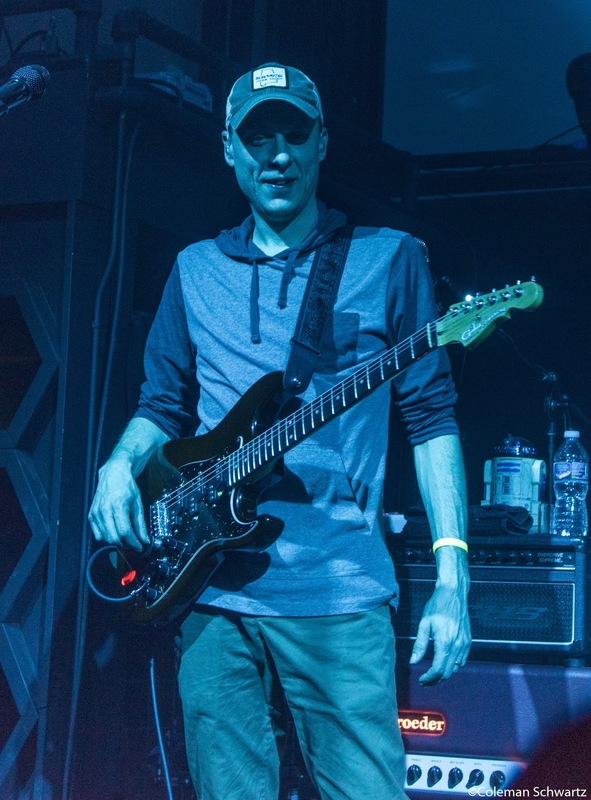 Bayliss tends to be more patient and more soulful than Jake, yet he still has the chops that allow him to keep up with Jake’s blistering style. Listen to “Nachos for Two” from before Jake joined the band if you do not believe me. Next on the agenda (or lack thereof) was the jazzy, but dark “Dump City.” A track from early in the band’s career, the self-coined term “improg,” rings true here as well. I was feeling flavors of metal, of the Anthrax variety, during the jam section. The band then moved into a “Soul Sacrifice” style jam, heavy on syncopation from Kris Meyers and Andy Farag. The furious tempo along with some first class face melting from Jake sent the happy crowd into a frenzy as the first set ended after five songs and seventy-five minutes. By now the crowd, which seemed larger that last night, was at critical mass. The outdoor balcony was jammed and the bouncers were letting one in and one out. It turned out to be a blessing. When I made it back in to find a good spot on the floor, I happened in through the VIP door and found myself on the small balcony. I mingled and watched the opening five minutes of "Triple Wide" before I was lured down to the rowdy dance party below. This was a stellar rendition of the trance classic and I cannot emphasize enough how hyped the crowd became during this tune. Kris Meyers was on point as he wove in some electronic drumming patterns complete with hip hop style snare “claps.” A few of the wilder folks riding the rail front and center began jumping up and down flailing their arms through the air in blissful abandon. 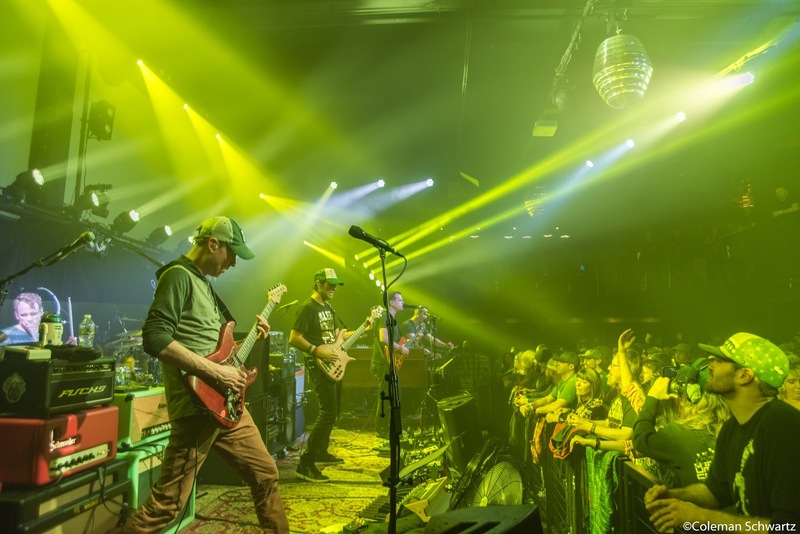 Soon the energy slowed for some of the most beautifully tactful improvisation, reminiscent of the good ol’ Grateful Dead. From there the boys landed on the opening lounge reggae guitar part of the beloved song “Higgins” off of their phenomenal B-side album The Bottom Half. It moves between cool reggae and hard driving 80’s arena rock. For me this is a song I love to wag my index finger to. Next was “Search 4,” an original that debuted during their Aragon NYE run ten years ago. I heard it then and heard it now. The opening riffs of the Chicago themed classic “In the Kitchen” sent the crowd into a fury. Needless to say, being from Chicago myself, I love this song and have since I first picked up a copy of Anchor Drops back in high school. The lyrics talk about the brutal winters that wrap around the Mid-Western metropolis. It’s a beautiful piece that touches on philosophical topics such as altruism, technophobia, and finding happiness. It was well received back in 2004, won Best New Song at Peter Shapiro’s now defunct Jammy Awards, and still carries weight 13 years later. The middle jam section coming out of "Kitchen" got funky fast, then very jazzy. They landed on an “island groove,” reminiscent of the Ali Baba’s Tahini track “Kabump” and featured some excellent face melting from Jake. The sole cover of the night was The Clash’s definitive new wave/dance-punk, "Rock the Casbah." 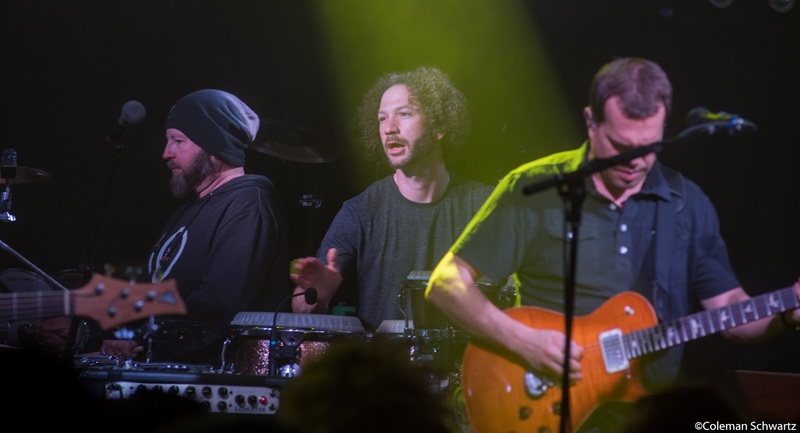 A surprise guest dropped in on Andy’s percussion rig, and it turned out to be Hive owner Jeff Grady, reinforcing the fact that this venue and band enjoy a personal bond. Jake took the vocals on this one and summoned his inner David Lee Roth for some aggressive metal-tinged crooning. The second set ended in a sweaty borderline mosh pit of a crowd. The encore began with the famous guitar riff that launches Anchor Drops, then fan favorite, “Plunger.” I love that guitar riff so much. It reminds me of toppling Jenga pieces. They then segued into the second half of “In the Kitchen,” complete with the lyrics from Brendan, “I hope you’ll f-cking be here tomorrow,” in lieu of the middle stew. Finally, they u-turned back into “Plunger” to close out the show. Hopefully, some more good shows will be coming this way in the future. Both Sandpoint and The Hive are something of a hidden treasure, a cozy intimacy wrapped in scenic splendor. And there’s that ingenious bee hive décor with the hexagonal bathrooms too. It’s well worth the extra traveling time.